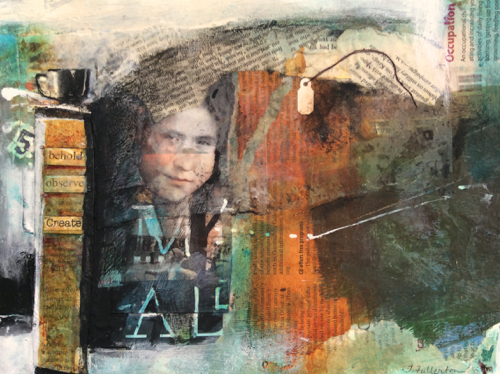 This small collage was half finished when I discovered it in my stacks of remnants. Newspaper pages once used as a palette had been glued next to a museum ticket from Italy. My interest and curiosity were aroused. I added the number 5 (my lucky number), a column shape with words from another collage, the coffee cup, the top portion of the face and the price tag. What appeared was a portrait of my inner artist. The face is 1/2 a Renaissance portrait (rebirth of the arts) and the eyes are my granddaughter Elise's (innocence). The words below the face say MY ALL with the Y reaching high as a tree. My lucky number 5 refers to serendipity. It appears that a fishing line extends to the green pond of abundant possibilities, and this curve circles back in the threads of the price tag with no amount...as in priceless. The red word Occupation showed up in the corner of the pages from a local newspaper, and next to it, an image of a window. The coffee cup which was added on purpose over the column, would suggest, ritual. Lifting a portion of the collaged material to re-glue,I discovered a photograph of many angels....what a divine surprise!